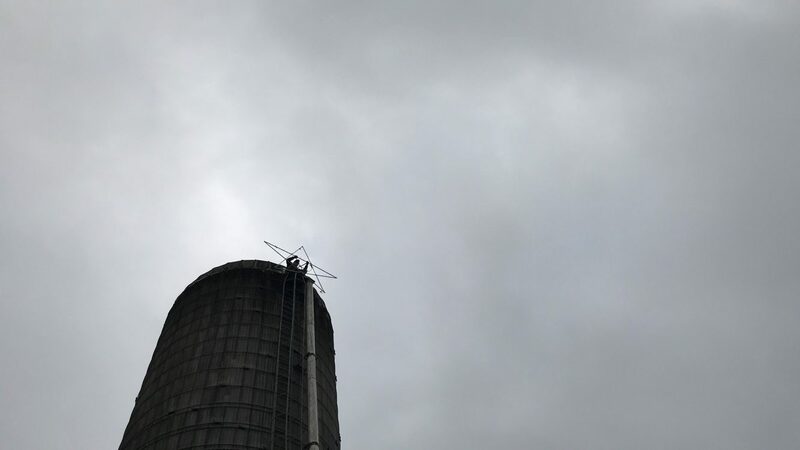 This Sunday afternoon, the lighted star rose to the top of the silo on Barstow’s Longview Farm. 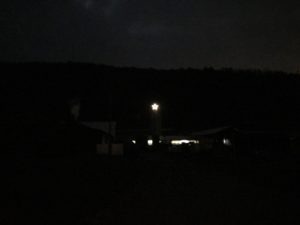 The star shines over the barnyard for December as the Barstows’ way of saying: happy holidays, Merry Christmas, we are thankful to be a part of this community. 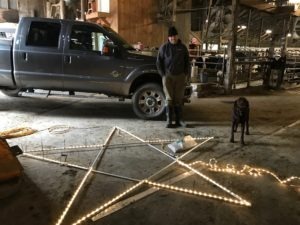 The star has been a holiday tradition on the farm for decades. The original star was wooden and terribly heavy. 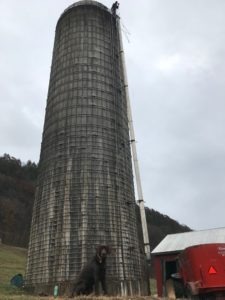 It was hauled rung by rung up the silo ladder every year. If left out, it would rot. 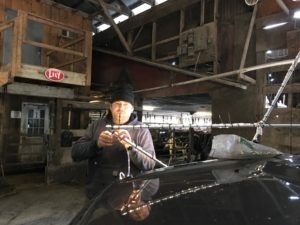 The star was secured with baling twine and (most of the time) made it through the holidays without crashing to the ground. Today, the star is made of a light weight galvanized electrical conduit. David Barstow made the latest model this year in the shop. Steven Barstow II attached LED lights to the frame to with zip ties. The LED string of lights uses less then half of the energy of a light bulb. Once constructed, the star is hoisted from the Earth, 75 feet to the top of the silo. This year, Steven did the hoisting, Denise Barstow did the ground work, and Moose Barstow did the supervising. Research suggests that traditions are important in building strong family relationships between generations. Traditions like these connect us to our family, our heritage, and our community during the holidays. Even i-91 commuters might enjoy the Longview Farm star from across the river as it is visible from the highway. When Steven Barstow II was a kid, Grandma Barstow would bake a pie for him after the star was placed. As we face the first holiday season without Grandma’s warm presence, Shannon stepped right in. She sent a warm homemade apple pie home with her brother and one for her uncle too! Happy holidays everyone! May your family traditions bring you great comfort and joy!